Way up in the deep blue night sky, a twinkling star hears a little girl’s birthday wish . . . 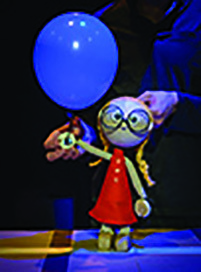 Presented by Visible Ficitons and told through a magical mix of puppetry, music, light and imagination, this is a heartfelt and humorous story of what can happen when the universe hears your dreams. For the past 25 years Visible Fictions has been creating innovative and dynamic theatrical productions for young people of all ages and their adults. For children aged 5 and under and their adults. Runs 50 mins. Part of the puppet Animation Festival 2019.